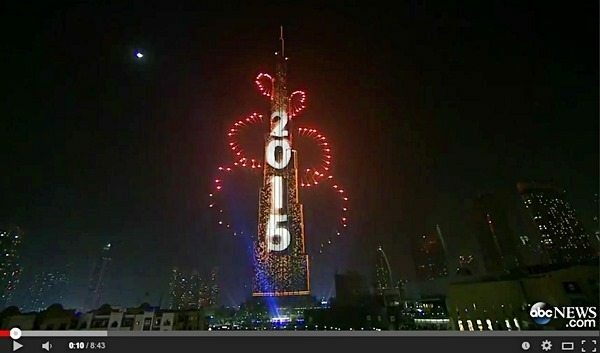 Burj Khalifa Fireworks 2015 Video: Happy New Year Dubai! Dubai welcomes the 2015 New Year with a Burj Khalifa fireworks display! People were crowding the fountain outside The Dubai Mall to witness the spectacular pyrotechnics presentation that only this Middle East Emirate can do. This is something that everyone is anticipating with the extravagant set-up and the amazing team that prepared the whole event. Here is a countdown video so you can replay this if you missed the event. You can watch the light show and fireworks video and welcome the New year here. Please click the play button to watch the presentation where only this city can offer! Welcoming the year 2015 with a bang! This was a jam-packed crowd and there were difficulties in terms of traffic and commuting but the Dubai Road Transport authorities implemented guidelines and were able to manage the crowd properly. Props to Dubai RTA for handling the traffic in the metro and the buses smoothly! Happy New Year Dubai! We hope everyone will have a prosperous new year as we face new days ahead!